Imagine that in high school you held the record for long distance running. In fact, you were inducted into your school’s hall of fame because of it. It’s many years later, and you decide to take your children back to see your plaque, but instead you see a huge touchscreen system, and happen to see your name and photo scrolling across the bottom. You touch it, and now not only can you see your high school photo with a bio of your accomplishments, but you can show your children actual video footage of yourself running in your final track meet. Instead of a dusty plaque on an overcrowded wall, you’re given an experience that will remind you how proud you should be of yourself for receiving this recognition, and assurance that it will never be forgotten. 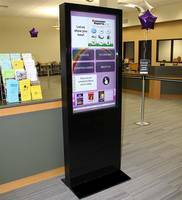 Fairport High School (Fairport, NY) as well as Penfield High School (Penfield, NY) have made the switch from their traditional outdated wooden plaques to 3 beautiful touchscreen systems. Fairport decided to highlight their Student Wall of Fame, Alumni Wall of Fame, and Education Wall of Distinction and enclose the screens with custom aluminum frames with their logo laser-etched on each. Penfield decided to highlight their Hall of Fame/All Americans, MVP/MIP, and a Photographic History board. Now, students and faculty can navigate through the years, find more information on featured colleagues and inductees, and even put a face to each name. 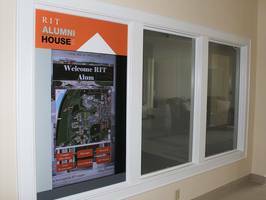 Rather than continuously having to have new plaques made and hang them on a crammed wall, these screens can be updated instantaneously, and new inductees can be featured and showcased right away. No more worrying about running out of space for Fairport and Penfield, that’s for sure.